Linearly polarized light oscillates in one direction and occurs quite often in nature. Most importantly, polarization emerges when light reflects and scatters. The skylight also displays polarized patterns in relation to the sun position. 90 degrees from the sun light is polarized and away from this angle the polarization diminishes. That is what bees and birds use to navigate and that’s what humans were unable to see till the beginning of the nineteenth century. Nowadays we use it in lcd screens, in 3d screens, in sunglasses, and in photography to cut out unwanted reflections and darken the sky. Some animals use polarization for the same reason as photographers—to discern patterns in highly reflective things and to see through water surface better. However, wearing polarizing glasses can leave you with a wrong impression that you know what it is like to see polarized light. The fact that eye sensors in some animals can natively detect the vibration direction makes us believe that the experience of seeing polarized patterns is not similar to wearing glasses, but is akin to colour vision. In other words, a mantis shrimp or an octopus is likely to perceive oscillation orientation of waves just like we recognize colours. Underwater, however, the ability to detect light polarization is more important since colours at depths are unreliable. That is why having as many visual cues as possible can be crucial in such environment. It might make little sense at first as water tends to depolarize light very quickly. But that comes as an advantage when invertebrates can communicate with each other. Terrestrial animals use bright colours and rely on camouflage based on colour patterns. Marine animals can add to their repertoire fluorescence, bioluminescence, and light polarization that are otherwise absent in the surrounding world. Squids and cuttlefishes, as an example of creatures that changes colours quickly, are also known to change polarization patterns on their skin as swiftly as they change pigment patterns. That is not a coincidence. Their eyes and eyes of other cephalopod molluscs are capable of picking up these signals. They can see patterns in an object that looks featureless to us. And they can send signals that are invisible to such primitive eyes as ours. Of course, the most advanced visual creatures on Earth couldn't miss such property of light. Yes, I am speaking of the mantis shrimp and their legendary visual system. They too possess polarization vision and they too can communicate with such signals. Not surprisingly, this communication phenomenon can also be found in the terrestrial environment. An example is Heliconius cydno—a tropical butterfly whose wings polarize light and members of the species can recognize these patterns. Cronin, Thomas W., et al. "Polarization vision and its role in biological signaling." Integrative and Comparative Biology 43.4 (2003): 549-558. I happen to employ polarized light often in my photography. And not to cut reflections, but to find interesting patterns in different animals. In fact, most of my images in the old microscope gallery are made using polarized light microscopy technique that happens to emphasize muscles and other regular structures. After reading a lot about vision systems in invertebrates I started wondering if what I saw in pond animals when illuminating them with polarized light has any meaning. 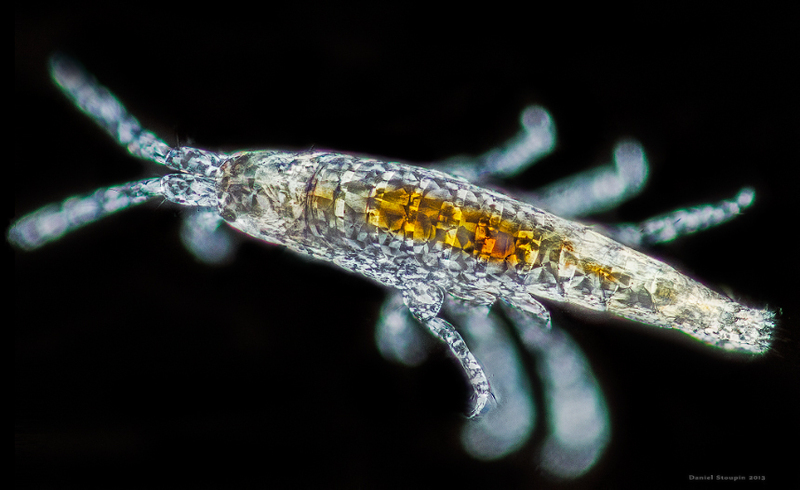 Can a predator make out reflections from the muscles of the transparent larva or a water flea? I haven’t found any research on that yet. Cohen, Jonathan H., and Meagan R. Putts. "Polarotaxis and scototaxis in the supratidal amphipod Platorchestia platensis." Journal of Comparative Physiology A (2013): 1-12. 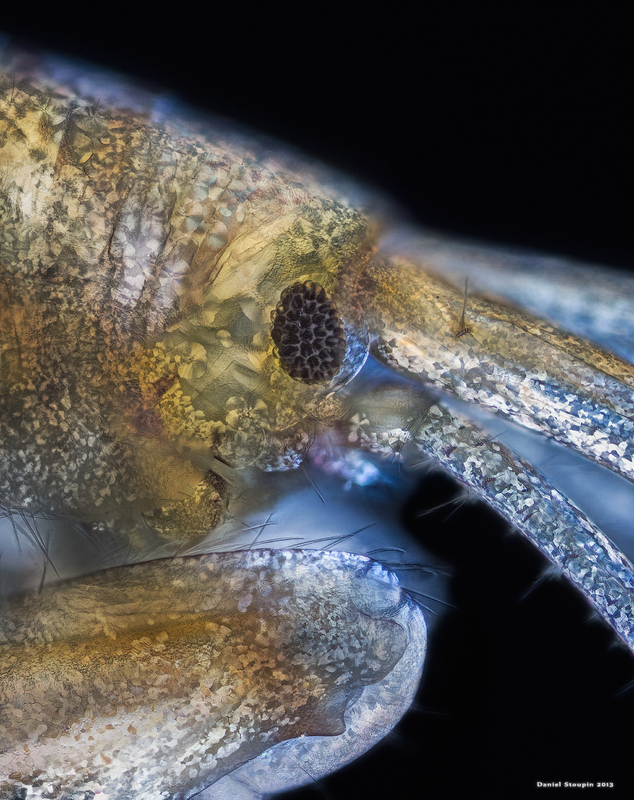 The authors studied polarization vision in one amphipod species and gave evidence that the crustacean uses it for navigation. 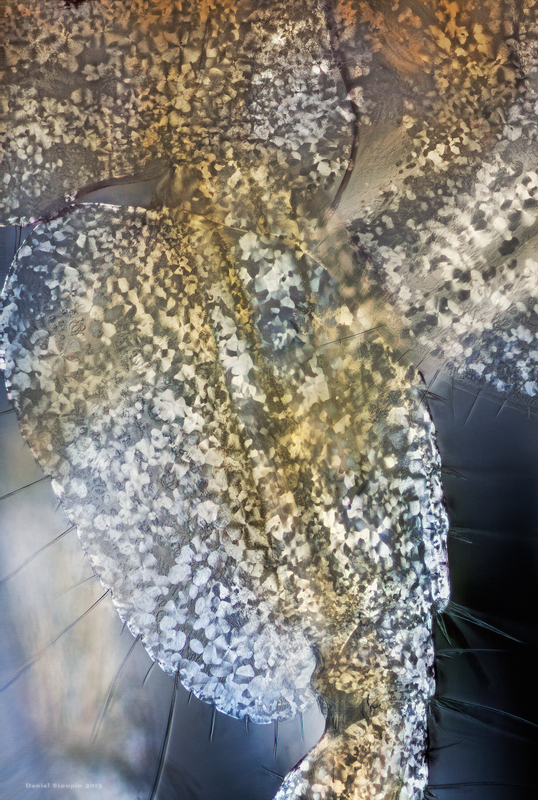 This work made me remember that some amphipods look very spectacular in polarized light, mostly from photos posted in photomicrography.net community. 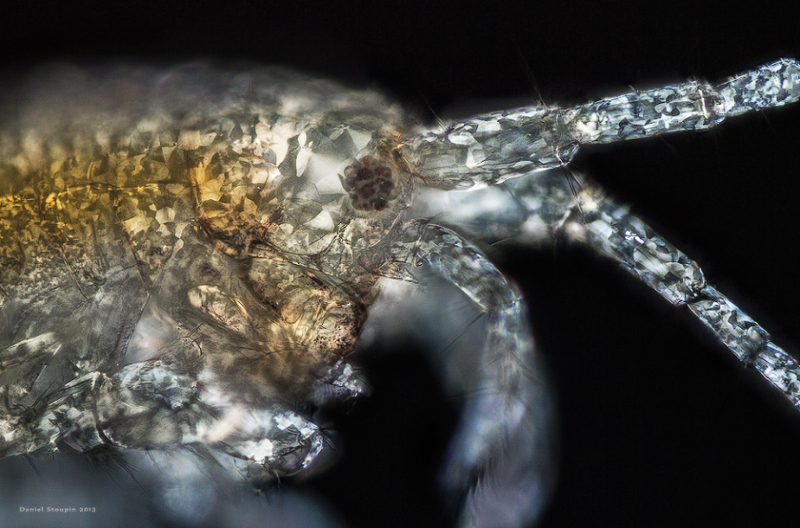 I decided to catch a few random amphipods (not of the same species) and make focus stacks under high magnification with crossed polarizers. I was amazed, to say the least! These guys are fabulous and all these patterns are absolutely invisible to our eyes. Amphipods are very common marine crustaceans that crawl on rocks looking for any sorts of leftovers and rotting flesh. They are generally small and the specimens I had were no bigger than 5-7mm. Patterns of every individual are unique. I also noticed a strong correlation between size of the crustacean and shape and proportion of spots. I look at these shapes and they make me puzzled over the purpose of these crystallized structures on the surface. Are they a coincidence or do they serve a special role in a creature that can see polarized light? Do they help them hide themselves from predators or are they means of communication? I wish I had unlimited time to be able to study everything interesting that I encounter. That means I leave these question without answers, but with an insight into a spectacular world outside of our vision system. Do remember, though, that what you see on these images is what camera sensor captures having a polarizer (analyzer) before the sensor and a polarizer after the light source, but not what an animal with polarized vision perceives.